You have TWO WEEKS to play along - Deadline to enter is Friday, September 28, 2018 at Midnight CST. The winners will be announced on the NND blog the following Monday. 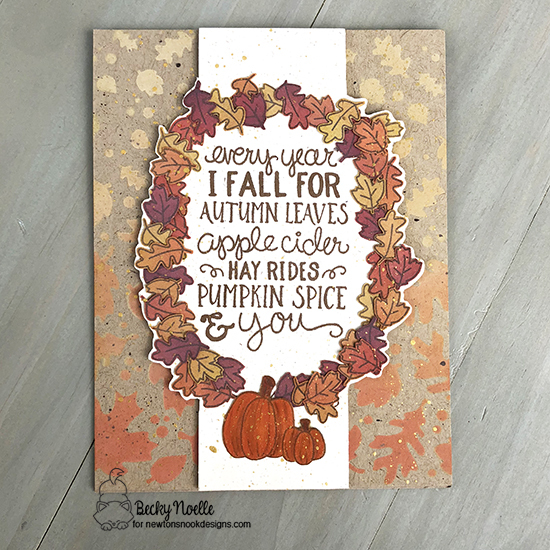 Becky Noelle begins this amazing card by using the Falling Leaves stencil to create her background. Then she does a lot of ink blending and stamps the teeny leaves from the Fall-ing in Love stamp set on top of the ink blending. She then fussy cuts all of those leaves out and arranges them around the poem. 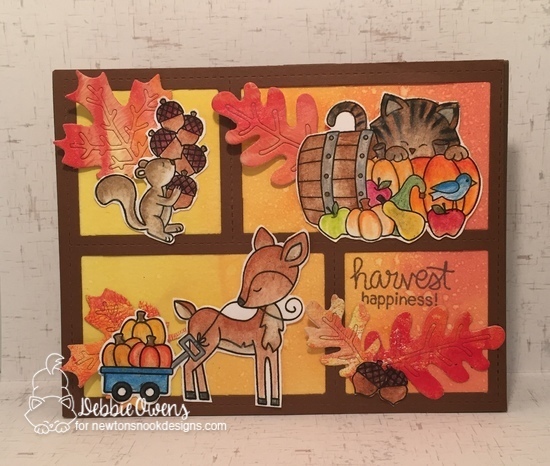 Her labor of love definitely pays off because this is a spectacular autumn card! Debbie Owens begins with a Distress Oxide background and layers on her die cut frame. She then adds a plethora of autumn critters by combining the just released Harvest Tails stamp set and the Autumn Newton stamp set. 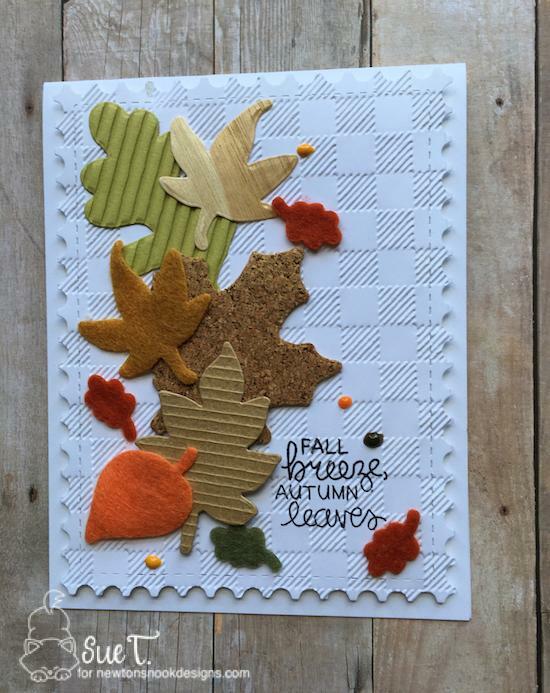 To finish her card off, she uses the Autumn Leaves die set to add add some fallen leaves. 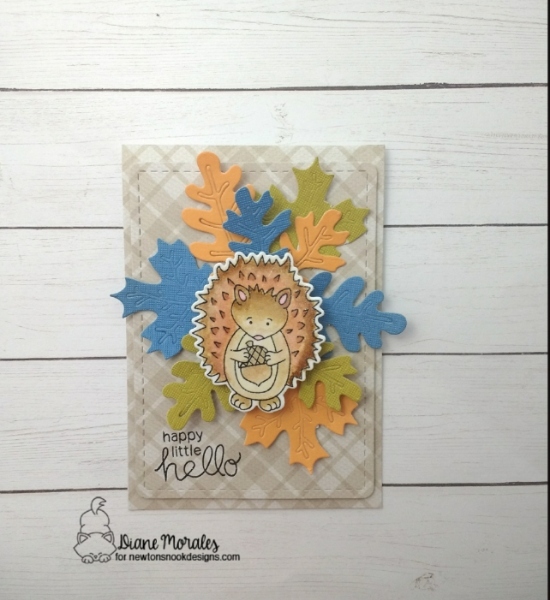 Diane Morales creates this sweet card featuring this adorable critter from the Hedgehog Hollow stamp set and coordinating die set. She places him atop a pile of leaves from the Autumn Leaves die set. (Don't you just love the light blue leaves?! Her layer of light tan plaid paper was created using the Frames & Flags die set. Sue T. creates this beautiful autumn card with lots of amazing textures. Using the dies from the Shades of Autumn die set, Sue cuts leaves from felt, cork and embossed paper. She then uses the Framework die set to cut her background and embosses it with a gingham pattern. She adds a sentiment from Autumn Newton stamp set. A sprinkling of enameled dots finishes off her gorgeous card! Thanks for the Fall challenge and lovely design team inspiration. 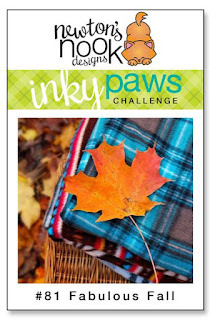 Gorgeous inspiration DT and fun challenge!